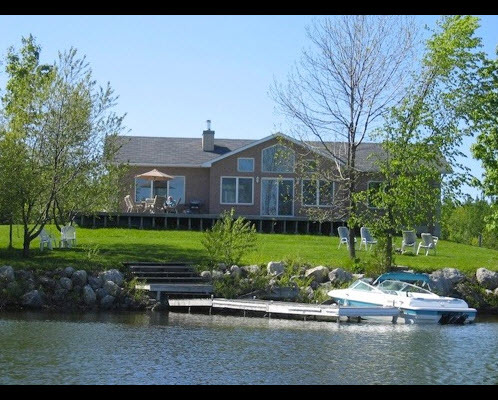 Waterfront property on beautiful Lake Eugenia located in the Beaver Valley, near Collingwood Ontario, about 90 min. from Toronto, Ontario, Canada. The Beaver Valley is known for the famous Bruce Trail along the Niagara Escarpment and also for the beautiful fall colours. 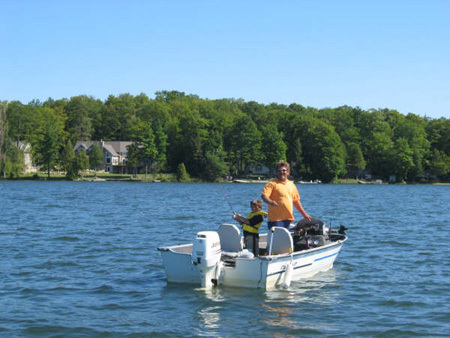 Lake Eugenia is a clean, shallow lake known for excellent Bass fishing. It is great for swimming, boating, and canoeing. The two bedroom suite(1500 sq. 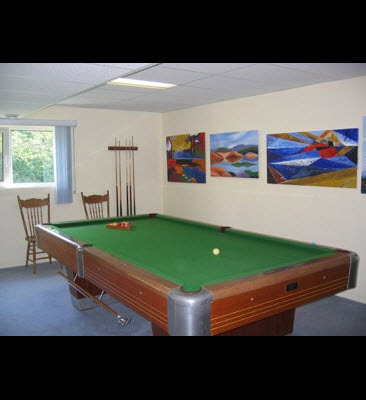 ft.-sleeps 8) has all conveniences, including your own pool table, kitchen, large living room, and bath room. The suite has been tastefully decorated and has comfortable queen beds. There is also a third bedroom with private bath available. Walk out to a private patio just steps from the lake. A gas BBQ and modern outdoor furniture is provided. Free use of pedal boat, canoe, and row boat is included. Hike the Bruce Trail, visit beautiful waterfalls, charming towns like Owen Sound, Meaford, Thornbury, Collingwood and Markdale. Enjoy the theatre and fine dining nearby. Visit many attractions like the Scenic Caves, the Suspension Bridge, Georgian Bay Beaches, and Wasaga Beach, all within 30 to 40 min. by car. Lake Eugenia is a man made lake created by Ontario Hydro. 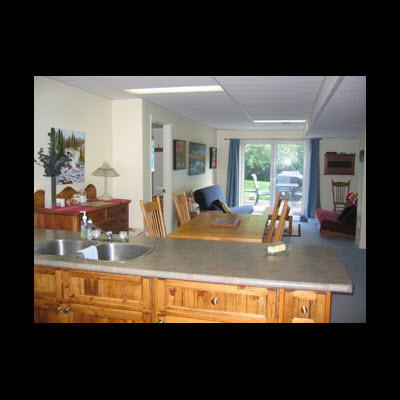 It is located in the heart of the Beaver Valley, near the town of Blue Mountains, Collingwood, Thornbury, Meaford, Markdale, and Flesherton. All are only 30 min. away. There are over 15 golf courses in the area that offer 9-18 holes at reasonable prices. Lake Eugenia is only 90 min. by car from Toronto, Ontario.From this central location it is an easy day trip to Ontario Place, Wonderland, or the Ontario Science Center. 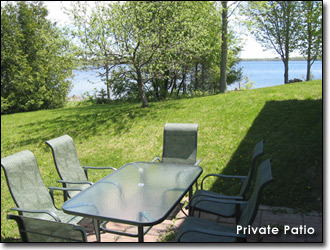 This location is also two hours from Muskoka, Niagara Falls, Tobermory, and the Bruce Peninsula. The Beaver Valley is also known for skiing and winter sports. The collingwood ski hills are only 30 min. away. There are two large bedrooms adjoining the living room and kitchen and dining area. The third bedroom is upstairs. Additional futons and pull out couch is in the living room area. Note the second bathroom is upstairs with the third bedroom. 12 credits per week for a family of 2 adults and up to 3 children under 12. Please ask for group rental rates. 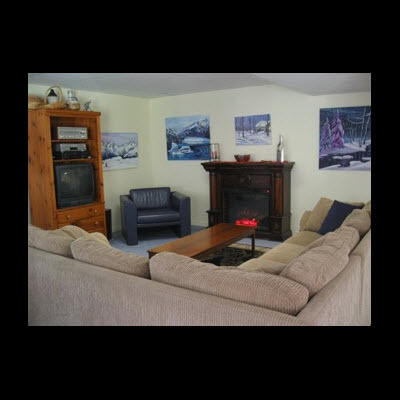 Rental for 2 adults is 8 credits per week or 1 credit per day. Directions From Toronto: take Hwy 10 north to Flesherton, go right at lights on Hwy 4(3.6km), left on #13(6.4km), right on Concession 12 B (formerly #31)-1.6km, right on Point Rd. Follow to 189 Point Rd. The nearest airport is Pearson International in Malton, which is about 90 min. by car. Loved it, would love to stay again. Great location to explore the southern area of Georgian Bay and of course the Bruce Trail. Very spacious unit. Our hosts were wonderful, Thank you!